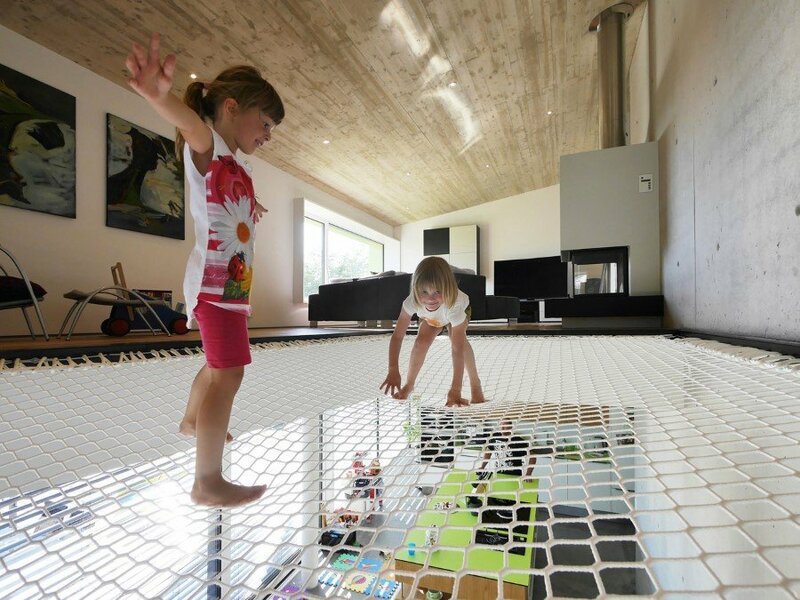 René Rissland in collaboration with Peter Dürschinger have designed this German family house, located in Wilhermsdorf, Germany. Description by René Rissland: The municipality of Wilhermsdorf is located west of Nuremberg in immediate vicinity of the Nature Park Frankenhohe. 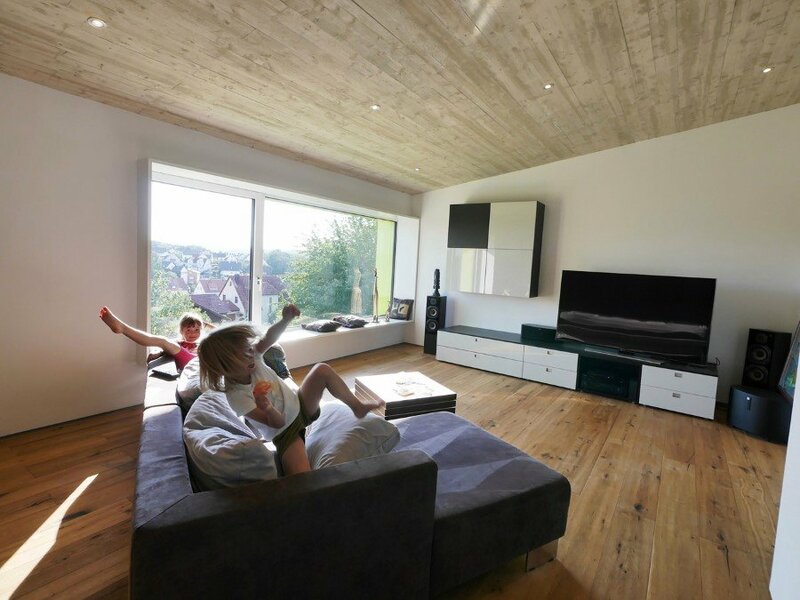 The plot is situated on the edge of a typical German family house settlement and impresses with its south-facing hillside. 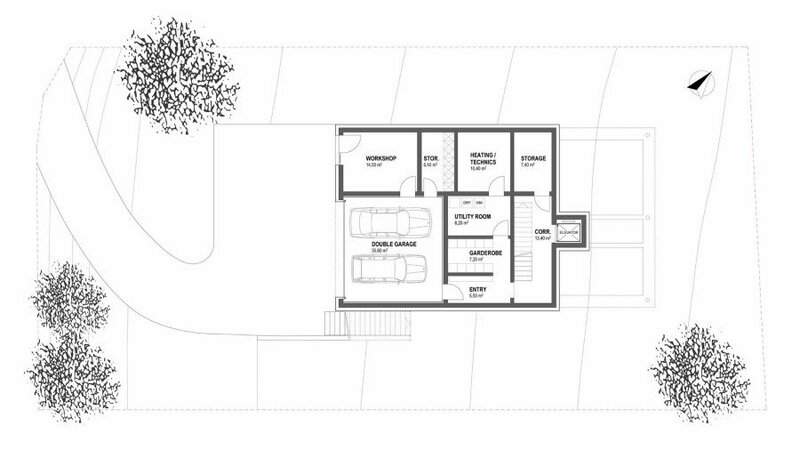 The development plan provides here a single-storey building with gable roof. 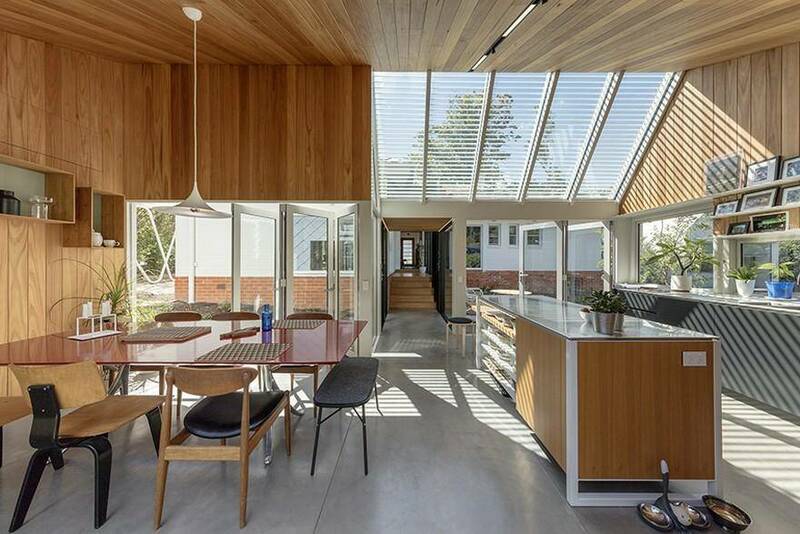 Client and architect have tapped the full potential of the rules and reinterpreted them in their favor. 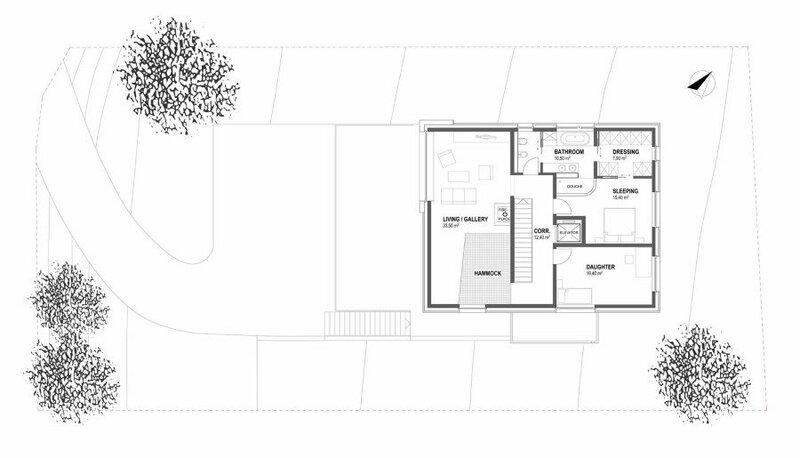 The result is a house that integrates well in the context despite of his individual appearance. The whole building stands on a base of garage and utility rooms. This pedestal bears the glassy ground floor, which is in fact rated as second basement. Above it hovers a black cuboid with a slightly inclined gabled roof. The glassed floor is the main entrance of the house. 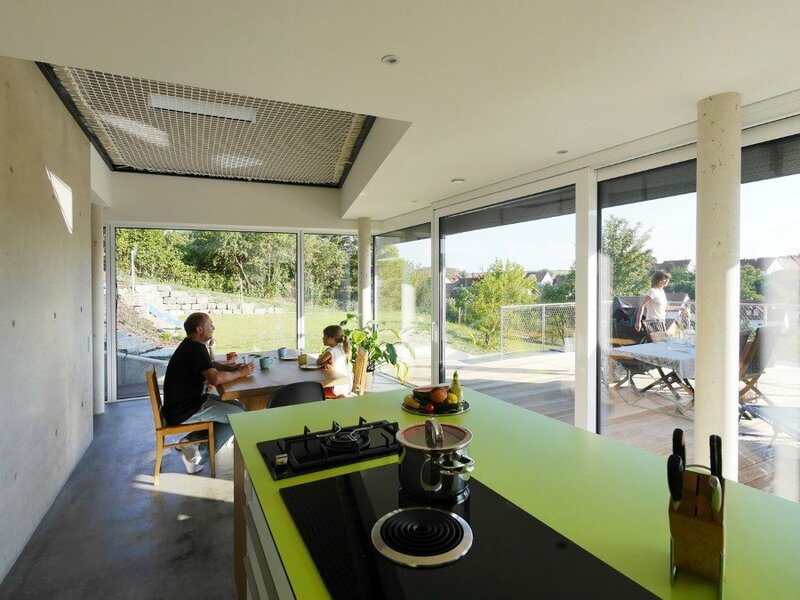 Kitchen and dining area are aligned to the terrace from which you can overpeer the whole valley. 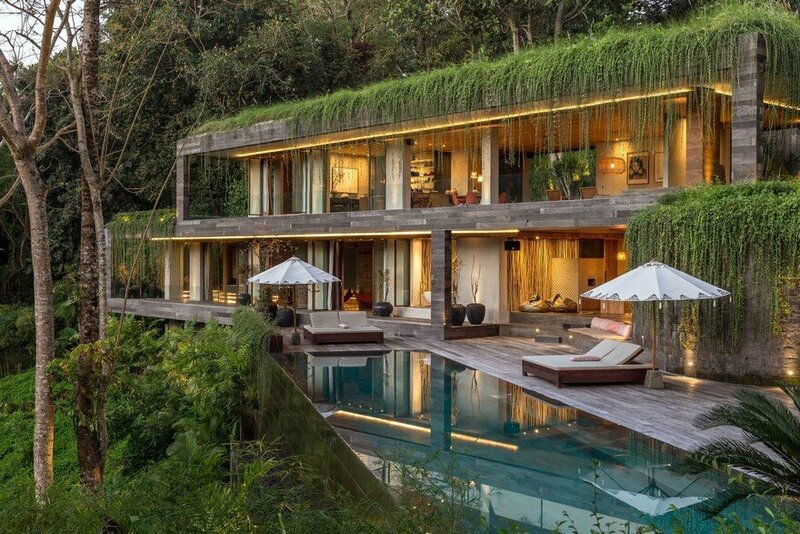 A full-fledged two-bedroom unit is arranged where the rear side of the building attaches to the hillside. 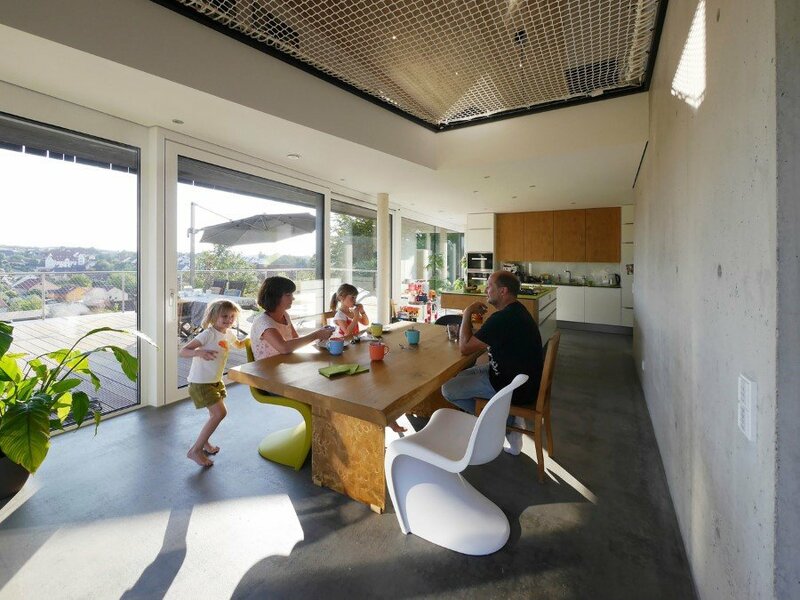 The unit can be flexibly used as an office or as a separate apartment. 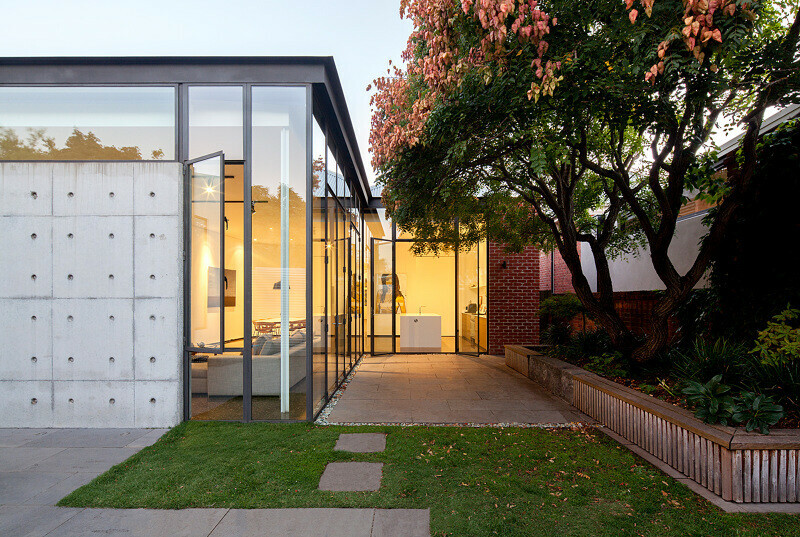 A concrete wall forms the central element on all floors across the house. 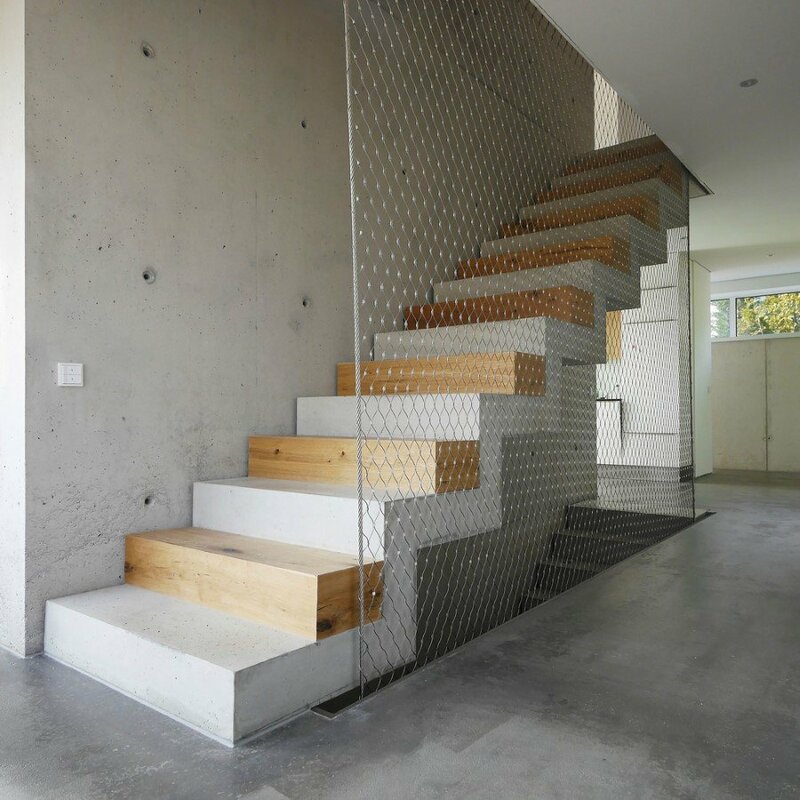 A folded zigzag staircase made of concrete connects the floors together. Every second stage consists of oak planks, a claviature of warm and cool tones. A steel mesh serves as fall protection. The living and sleeping areas are located upstairs. 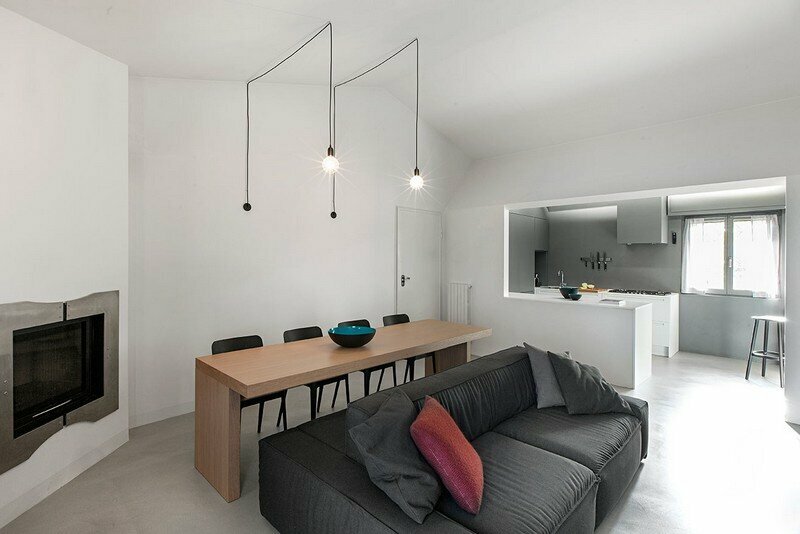 A small gallery mediates between dining area on the ground floor and living area above. 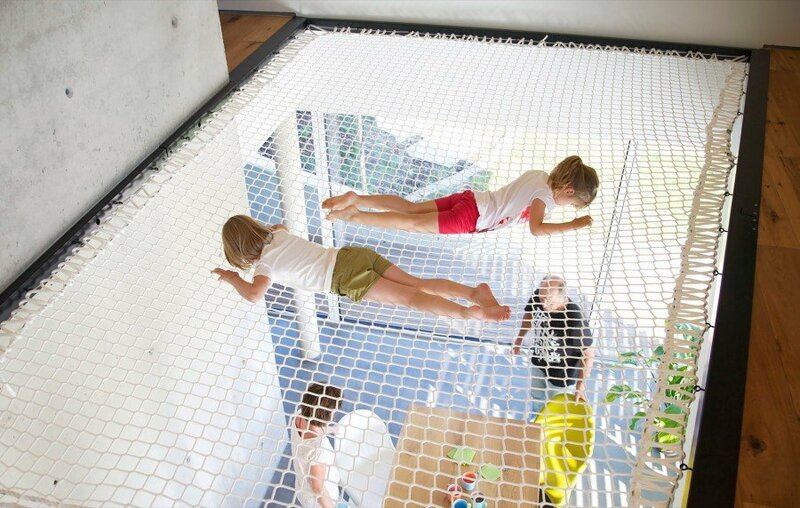 The airspace is covered by a white protective net and is used as a giant hammock – the preferred playground for the little daughter and her friends. 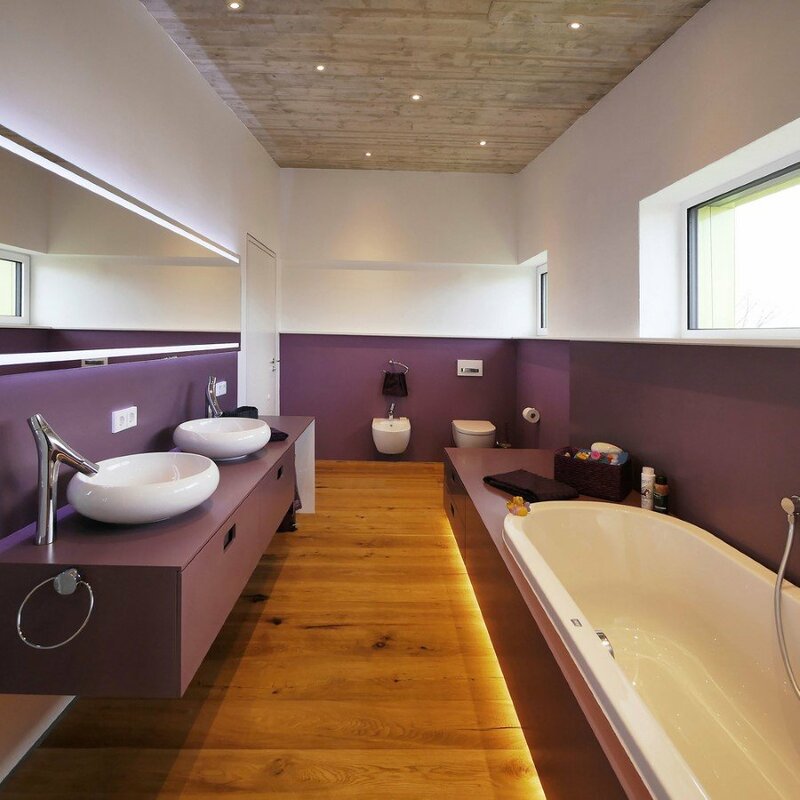 The principle of semipermeable zoning was also applied between bathroom and bedroom. 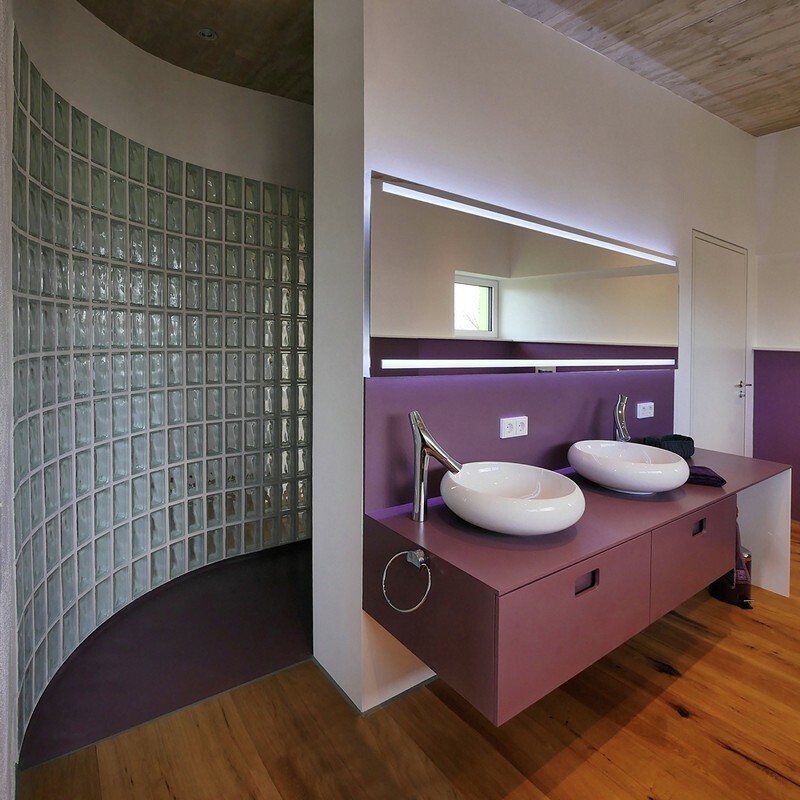 A curved glass brick wall projects vaguely glimpses of the shower area to the parents bedroom and feeds the appetite for more. In the living area invites a huge panorama window to sit down and relax. It opens a wide view over the surrounding natural scenery and the roofscape of the settlement through the historic old town. The roof soffit was shuttered in traditional concrete technology with wooden boards. 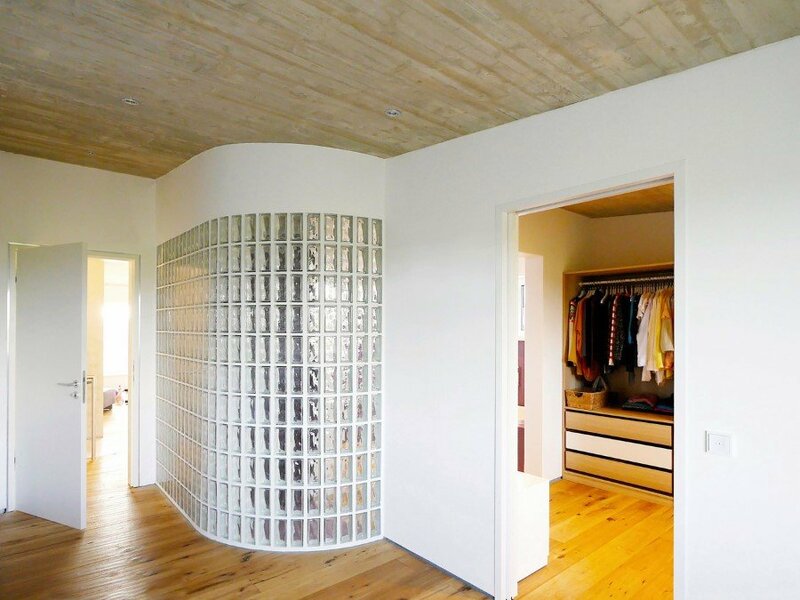 The concrete-texture reflects in width and joint pattern the oak floorboards of the upper level. The exterior facade of the upper floor is covered with charred larch. The silky-mat black-shimmering carbon layer protects the wood from parasites and the weather. 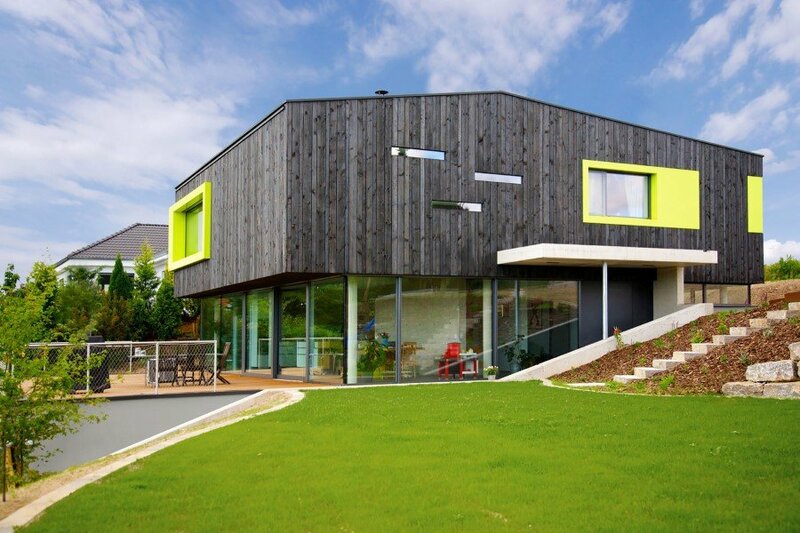 It offers an intelligent alternative to the conventional wood protecting agents. The method of wood pyrolysis, borrowed from the Japanese Yakisugi, was refined and optimized by a specialist company from northern Germany. Therefore the necessary amount of burnt wood could be produced within a short period of time. 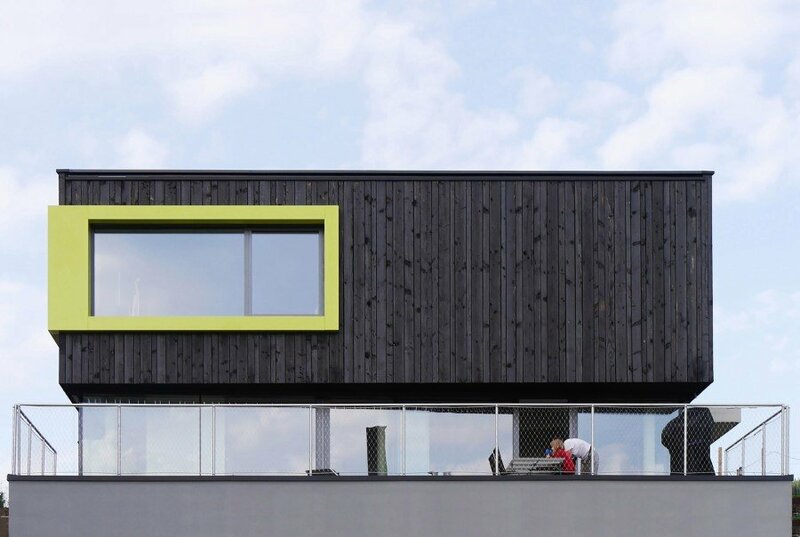 The black-shimmering facade integrates well into the landscape, both summer and winter. Yellow green metal frames accentuate the facade, emphasize individual windows and connect others. Even in old age, the building should meet the demands of the residents needs. 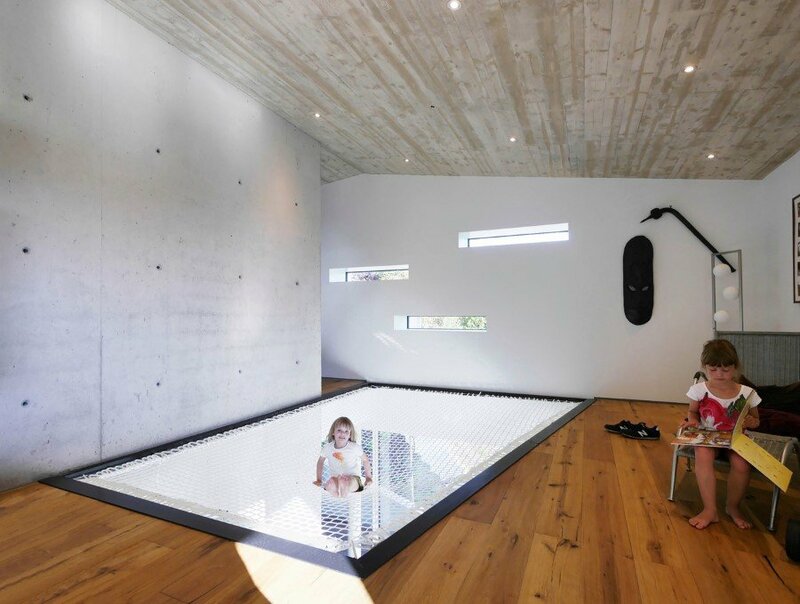 Therefore and despite his slope position the house is built entirely barrier-free. All floors are accessed via a central lift. 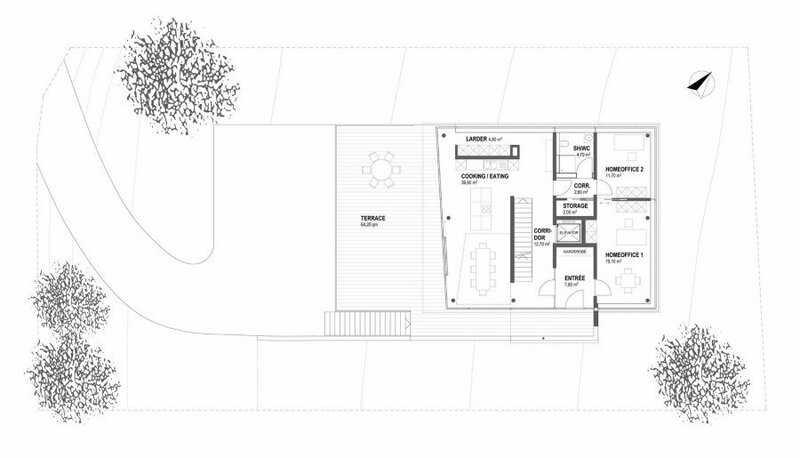 The layout with its flexible divisibility of units allows an intergenerational and demand-oriented use or adaptation. 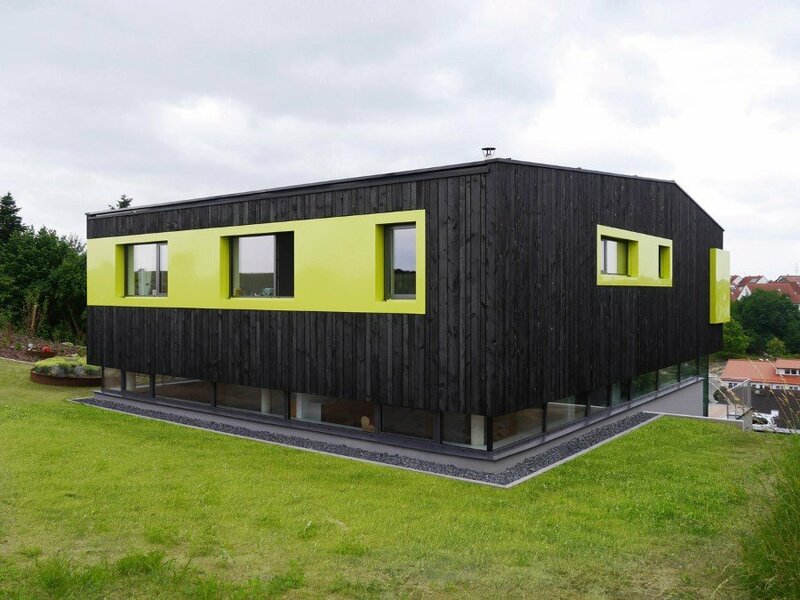 Power is supplied by geothermal energy supported by solar panels on the roof. Thereby the house is autonomous from local energy suppliers and the fluctuating oil and gas prices.